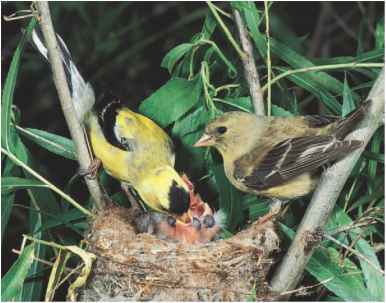 Physical characteristics: Male American goldfinches are colored an overall bright canary yellow, with black wings marked in double white bars and white edging, a black tail, and a black face cap. Males are not as brightly colored in the winter. Females are a dull grayish-yellow, with dark wings and tails, pale yellow under parts without a black cap, and olive upper parts. Juveniles are olive-yellow, with darker wings. Adults are 4.3 to 5.0 inches (10.9 to 12.7 centimeters) long and weigh about 0.5 ounces (14 grams). Their wingspan is 8.8 to 9.0 inches (22.4 to 22.9 centimeters) long. 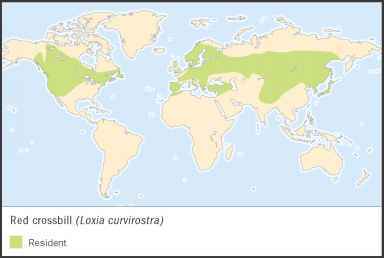 Geographic range: American goldfinches breed throughout most of southern Canada and the northern half of the United States. It winters in extreme southern Canada, through most of the United States, and northern Mexico. Habitat: American goldfinch is one of the most common birds in the United States, usually seen in parks, farms, and suburban gardens. They inhabit open, mixed-species forests, and shrubby areas. They winter in shrubby habitats, old fields, and parks and gardens. Diet: Their diet consists of small seeds and grains, especially liking plants in the aster family, including sunflower, lettuce, and thistles. They also eat insects. Behavior and reproduction: American goldfinches fly with a very unique bounding flight. They are migratory birds, and social during the nonbreeding season when they are often found in large flocks, usually with other finches. The birds breed in loose colonies (bird groups that live together and are dependent on each other). Their courtship rituals include daring maneuvers and singing by males. Males court when their bright plumage appears. Their song is a series of musical warbles and trills, often with a long "baybeee" note. When flying, they sing songs like "per-chick-oree" or "po-tato-chips." Monogamous American goldfinches begin to breed around the middle of June in their northern habitat, while in southern climates, they breed as early as March and continue through July. They defend a nesting territory. Most mating pairs raise only one brood each year. They build small cup-shaped nests that are woven with grasses and other plant fibers. Nests are placed in large thistles, other tall weeds, shrubs, or trees. Females lay four to six pale bluish white eggs. The incubation period is ten to twelve days, performed only by females. 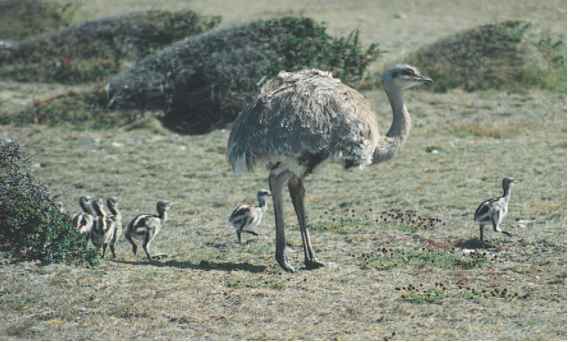 Both mates feed their young with a fledgling period lasting eleven to seventeen days. Young spend the fall following their parents. One to two broods occur each year. American goldfinches and people: People find American goldfinches to be very popular birds to watch. It is the state bird of Iowa, New Jersey, and Washington.